Sas Allardice and Mel Willard of Gung Hoe Growers are among those at Harcourt welcoming grants to help combat Queensland fruit fly. Efforts to avert the threat of fruit fly before it impacts on local fruit and veg producers have been ramped up at Harcourt with the announcement of a new series of state government grants. 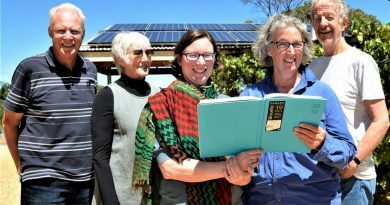 Bendigo West MP Maree Edwards visited local organic fruit producers, Mount Alexander Fruit Gardens, on Friday to announce just under $20,000 in grants for local organisations to help tackle the looming threat. The local grants are part of the state government’s wider approval of $1.6 million in grants to tackle the destructive Queensland pest, which unchecked has potential to decimate Australia’s valuable fruit and vegetable production sectors. “It’s particularly concerning here where we know fruit is the centrepiece,” Ms Edwards said. 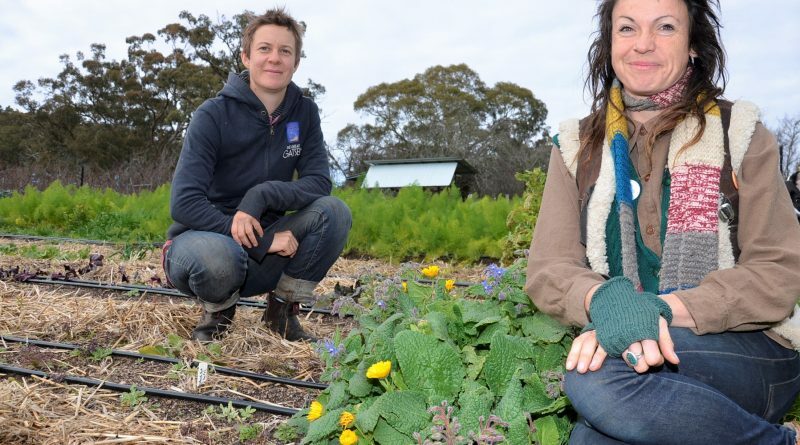 The local grant recipients are Harcourt Valley Landcare Group, Bendigo Regional Food Alliance Inc, Greater Bendigo City Council and Mount Alexander Shire Council. Bendigo Regional Food Alliance received $4930 to deliver fruit fly mapping, community pruning and fruit fly management workshops. Each of the other recipients got $5000 to help raise community awareness and develop education videos. 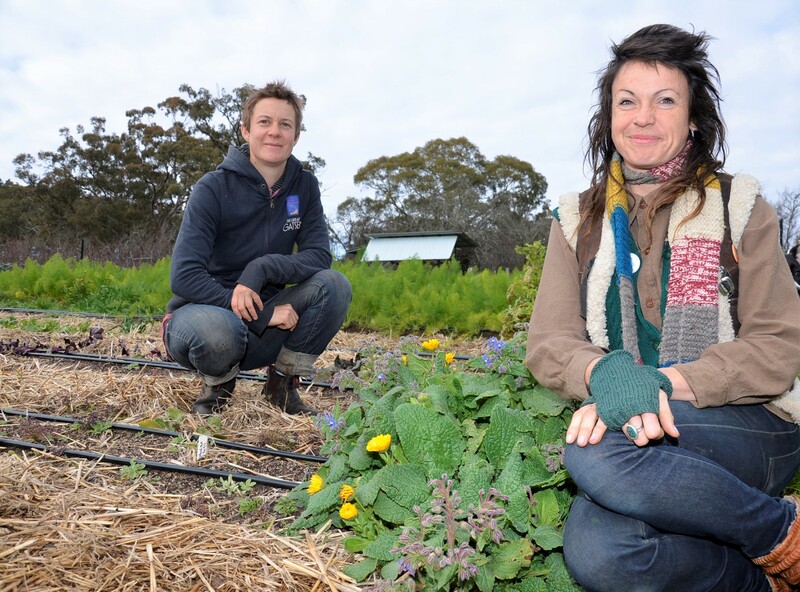 Those attending Friday’s announcement included local commercial organic vegetable and herb growers like Mel Willard and Sas Allardice of Gung Hoe Growers. “Fruit fly doesn’t just affect fruit. 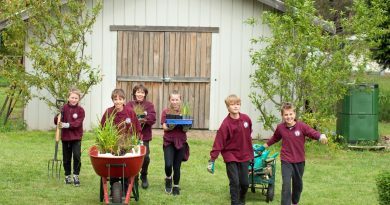 It affects vegetables as well and being able to prevent it is the most important thing,” Ms Allardice said. Hugh Finlay of Mount Alexander Fruit Gardens said while there had as yet been no confirmed trappings of Qld fruit fly in Harcourt the threat was “massive”. “We’re really pleased about this announcement because it does raise awareness of fruit fly as a potential threat both to the fruit industry and as a general community issue,” he said. Maldon Neighbourhood Centre's David Morland, Pam Millwood, Amy Atkinson, Ali Brookes and Peter Strang ahead of next week's Understanding Climate Impacts public presentation. 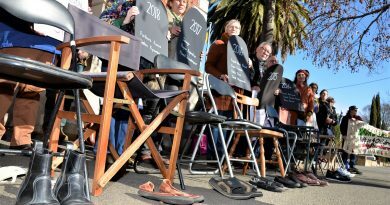 Empty chairs and empty shoes at last Thursday's rally in Castlemaine symbolised lives lost in detention centres at Manus or Nauru over the past five years.